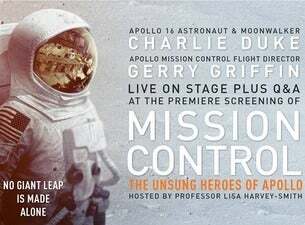 THE EPIC FILM WITH TWO APOLLO LEGENDS LIVE ON STAGE! Haviland Digital and Live on Stage Australia in association with VISIT HOUSTON and UNSW Canberra Space present the Australian Screenings of the epic film, ‘Mission Control: The Unsung Heroes of Apollo’, featuring an exclusive Q&A with retired Brigadier General USAF, CAPCOM NASA, Apollo 16 Astronaut and Moon Walker, ‘CHARLIE DUKE’ with Apollo Mission Control Flight Director ‘GERRY GRIFFIN’ who both star in the film together with the filmmakers of Mission Control, LIVE ON STAGE! Each show will be hosted by acclaimed Australian Astrophysicist, Professor Lisa Harvey-Smith. This special event will include a special tribute to the Commander of Apollo 17 - CAPTAIN GENE CERNAN, who also stars in the movie and who toured Australia in 2016 to promote the award-winning film about his life, ‘The Last Man on the Moon’. A Strictly Limited number of MEET & GREET Packages are now available through Ticketmaster. At the heart of the Apollo space program was the team who worked in Mission Control. Some came from a rural lifestyle unchanged since the 19th century. Others grew up in a blue-collar America of mines and smoke stacks. Through the team’s testimony and the supporting voices of Apollo astronauts and modern NASA flight directors, the movie explores their journey from the faltering start of the program to the glories of the Moon landings, and the rescue of Apollo 13. Charlie Duke is a NASA astronaut who explored the moon during Apollo 16. He became the tenth and youngest man to step onto the lunar surface, just minutes after his crewmate, the late John Young. Charlie Duke is one of five remaining living legends to have walked on the lunar surface. However, he is perhaps best known for his crucial role as CAPCOM — the spacecraft communicator - during the dramatic and dangerous landing of Apollo 11. It was he who passed crucial instructions to Neil Armstrong and Buzz Aldrin as they encountered computer problems during their descent. And when Apollo 11 ran long on its landing barely reaching the lunar surface before using all of their fuel, it was Duke who deadpanned, “Tranquility, we copy you on the ground. You got a bunch of guys about to turn blue. We're breathing again. Thanks a lot!" Upon graduation from Texas A&M Gerry was commissioned as an officer in the United States Air Force. He served four years on active duty, first in flight training, then flying as a weapon systems officer in jet fighter-interceptors. In 1960 Gerry left active duty and began his space career as a systems engineer/flight controller at the USAF Satellite Test Center in Sunnyvale, California. In 1964 Gerry joined NASA in Houston as a flight controller in Mission Control, specializing in guidance, navigation and control systems during Project Gemini. In 1968 he was named a Mission Control flight director and served in that role for all of the Apollo Program manned missions, including all nine manned missions out to the moon, six of which included lunar landings. Gerry’s “Gold” team conducted half of the lunar landings made during Apollo: Apollo’s 14, 16, & 17. His team was scheduled to conduct the landing of Apollo 13, but when the landing was cancelled as a result of the oxygen tank explosion, his team played a key role in the safe return of the astronauts. Because of his real life role as a flight director during the troubled flight of Apollo 13 Gerry was a technical advisor for the movie Apollo 13. Later he was a technical advisor for and an actor in the movies Contact, Deep Impact and Apollo 18 to name a few and is a member of the Screen Actors Guild.